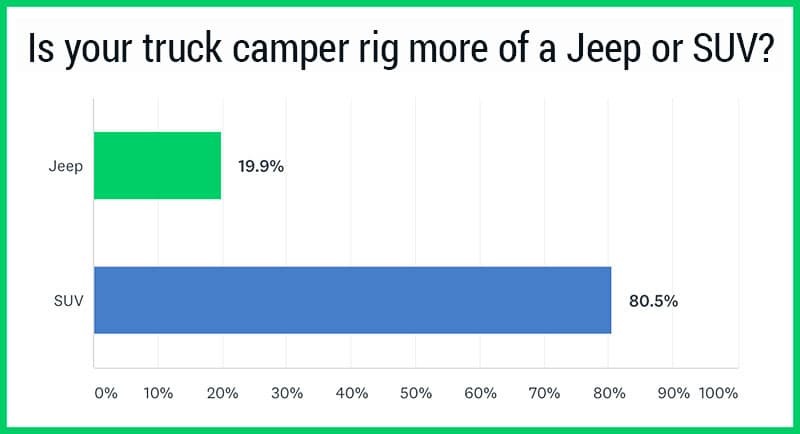 This week’s Question of the Week was, “Would you consider your truck camper more of a Jeep of RVs or an SUV of RVs?” Before explaining their answer in detail, we had a poll on the same question. The resulting graph is quite telling. Clearly most of us consider our truck campers to be more of an SUV than a Jeep when it comes to off-road capabilities, but that’s not the whole story. First, there are truck camper owners who specifically designed and assembled a truck and camper to maximize off-road capability. Most of these same folks have also developed their off-road driving skills for years. Put these two elements together and we have the closest thing possible to a true Jeep trail capable truck camper rig. Second, most truck camper owners have no intention of tackling Jeep trails with their rig. Either they’re not interested, or simply know better given the relative durability, size, and weight of their truck and camper. 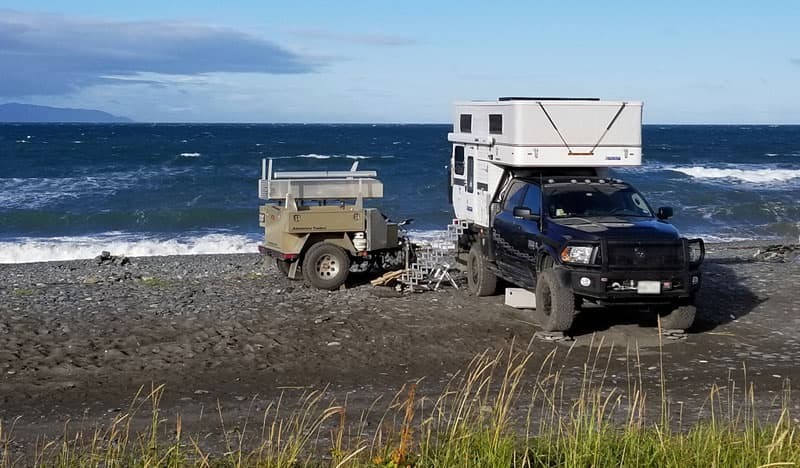 These folks consider their truck camper rigs to be more like SUVs. We are squarely in this camp ourselves. You are going to love the stories about how a good number of us discovered our off-road limitations – the hard way. Other readers share the thought processes they have about what off-road opportunities they pursue, and which they pass. The overall moral of these responses is this; be realistic about the off-road capabilities of your rig and your driving skills. A lapse in judgement off-road can be very expensive, if not dangerous. If you want to go off-road and you’re not experienced, be prepared, do your homework, and take baby steps. We’ll be right behind you. “We ran a 2006 Wrangler Rubicon towing an off-road trailer for ten years. It worked well for dryer climates of the southwest for one to two week trips from our home base in Texas. We wanted our retirement rig to be capable for longer trips to some not so dry climates. This past summer we made the drive up to the Prudhoe Bay. The comfort of the truck camper on the highway and capability of the truck off-road gave us the confidence to go where we wanted. Additionally, we had a comfortable place to spend the nights when the weather outside was less than ideal. “The wheel base of our truck is 176-inches and the full length is about 21-feet. That is too long for a Jeep trail. We have taken some backcountry byways that are very rough, but they tended to be open county in Montana, Wyoming, Utah, and New Mexico and had no super short turns. “At 11,000-pounds, 26-feet long, 11-feet high at the roof, plus air conditioner, and 8.5-feet wide, I’m not going anywhere seriously off-road. The truck camper has been on logging roads, gone slowly across the prairie, and spends a lot of time on gravel roads – which city folks seem to consider off-road.